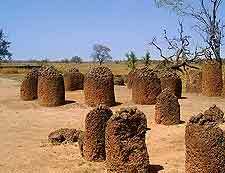 The Gambia has several fascinating landmarks and monuments, the best-known of these is the Senegambia Stone Circles, including those located at Wassu. These mark various burial sites, the Senegambia Stone Circles are to be found clustered in large numbers, rather like small pillars in their appearance and shape. 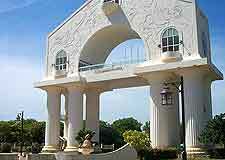 For tourists/ travellers to the city of Banjul ( capital of Gambia) the Arch 22, Fort Bullen and the Banjul State House are popular sights to see and serve as three of the city's most prominent and famous landmarks. 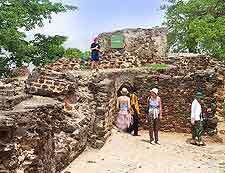 Also on James Island in the Gambia region, the remains of Fort James can be found and are of great historical significance to the Gambian people in and around Fort James.